Julia Bryant is a highly recommended textile artist specializing in crocheting, knitting, tapestry weaving and counted cross-stitch. Julia Bryant became fascinated with Afghan/Tunisian crochet about twenty-five years ago, and has been developing and perfecting her skills using the color inlay technique ever since. 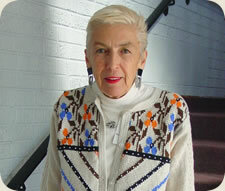 Her work is often embellished with beads, bobbles and embroidery, and she creates all her own designs. Julia Bryant lives in Toronto, Canada, she has a passion for color and loves to teach! Julia is a founding member and co-president of a Toronto Knitters’ Guild, a member of the Toronto Hookups, a member of the Knitters’ Guild of America, and a professional member of the Crochet Guild of America.